The Supreme Court will decide whether a cross in the middle of a Maryland highway can stay. 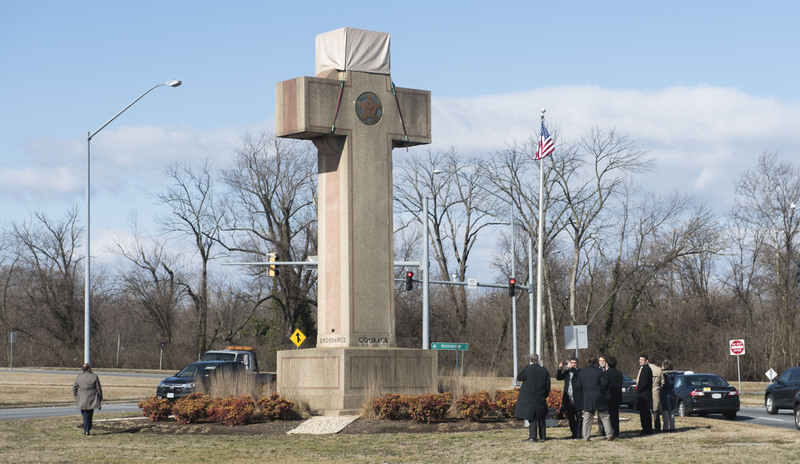 The cross is a World War I memorial, but some folks say it means the city of Bladensburg unfairly favors Christians. For years, Steven C. Lowe thought a 40-foot-tall concrete cross near his home was odd. He didn’t realize it was a memorial. A plaque lists the names of 49 area residents who died in World War I, but it isn’t easily read from the road—and getting to the monument requires dashing across traffic. The group lost the first round in court. But in 2017, an appeals court ruled the cross was unconstitutional. Now, supporters are asking the Supreme Court to overturn that ruling. Justices will hear the case tomorrow. Backers of the nearly 100-year-old cross, also called the “Peace Cross,” say if the justices rule against them it could threaten hundreds of monuments nationwide. Opponents argue that the cross should be moved to private property or changed into a nonreligious shape such as a slab. Similar monuments have gotten mixed rulings from the high court. In 2005, the court upheld a Ten Commandments monument on the grounds of the Texas state capitol but struck down Ten Commandments displays in Kentucky courthouses the same day. Why do you believe people find crosses so offensive? Do you think using the cross as a memorial violates the U.S. Constitution? Thank you Lena, I cannot say how nice it feels to finally have someone understand the point I made a while back about the "first comment" thing being a waste of time and space. I agree with moving the monument to private property or something. It's also a world war I monument so I would keep it if I were them. HAPPY BIRTHDAY ALAYNA E.!!!!!!!!! how old are you turning? I would say just leave it alone or else move it to someone's property, but have it open to the public. Also, if that is violating the constitution, don't you think that pennies with "In God We Trust" written on them are also violating it?!?!?! A cross is a very popular gravestone, and I think it's fitting for a war memorial. If it was just a christian monument, I would understand some peoples anger, but its not. Its a war memorial. They shouldn't tear it down! Its a memorial! As for those people that say it favors Christians well they have to learn that you don't always get wat you want!!! Why do these people keep finding things that might relate to religion and Christianity, and take that to court? Why not just leave that stuff alone, and if you are really worried about fairness between religions, just go make your own monuments? They should not tear it down! If other religions are that concerned about it they can just move it, not destroy it. I think the words on pennies could be for any religion. But maybe it will become an issue. I know your birthday was yesterday, but I didn't see the comments until today, so happy late birthday! You actually share a birthday with one of my friends, so that's cool. also why are they going to court? this is what the worldteen edotors posted . im just trying to get thhe worl out! The First Ammendment was established to prevent a state-sponsored church like the Church of England from happening in the United States. That doesn't mean tearing down a monument meant to honor U.S. soldiers because it displays the greatest symbol of freedom ever: the cross. If people are having such an issue with a war monument, then they have forgotten what this country was founded on and why men and women stand up to defend it.